Elevation ~ 21mm - 22.5mm. 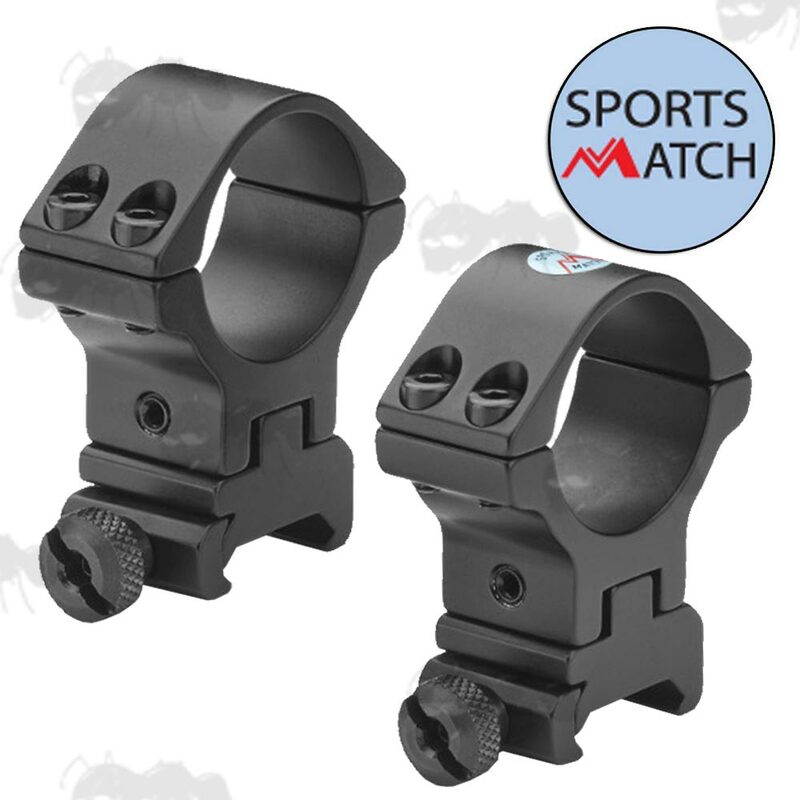 For up to 56mm lens diameter (on most rifles). Elevation ~ 26.5mm - 29mm. 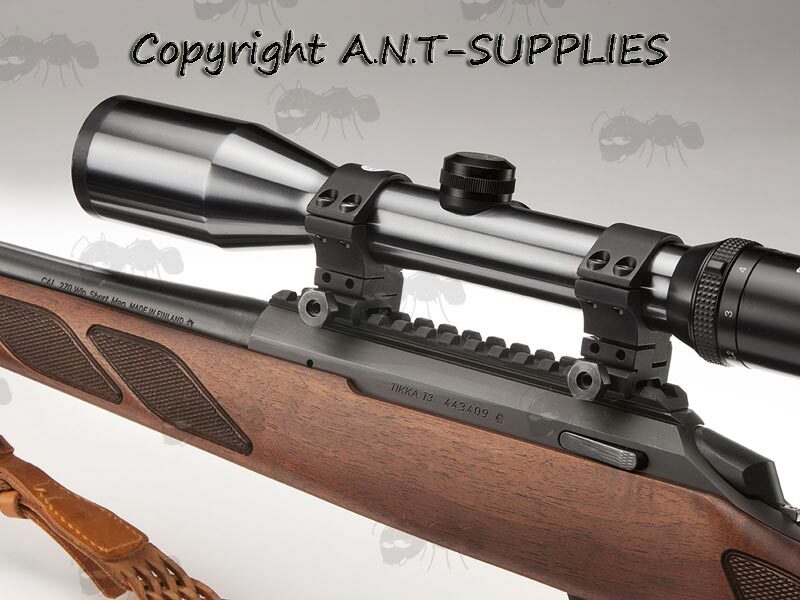 For up to 60mm lens diameter (on most rifles). Fits 20mm wide weaver / picatinny rails. Double clamped, 21mm thick scope mounts for weaver/picatinny rifle rails. 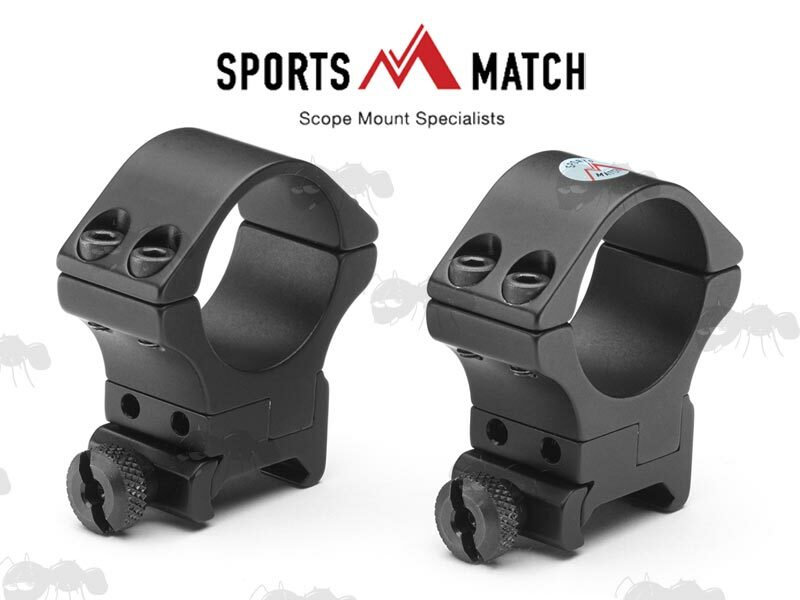 Also available ~ SportsMatch Adjustable Dovetail Rail Scope Mounts. Adjustable for windage and height. Lateral position also adjustable for perfect weaver centering. High tensile construction with a totally solid mechanism utilising fasteners with a special anti vibration coating. to ensure no loss of zero. Includes square section hardened steel arrestor bolt. 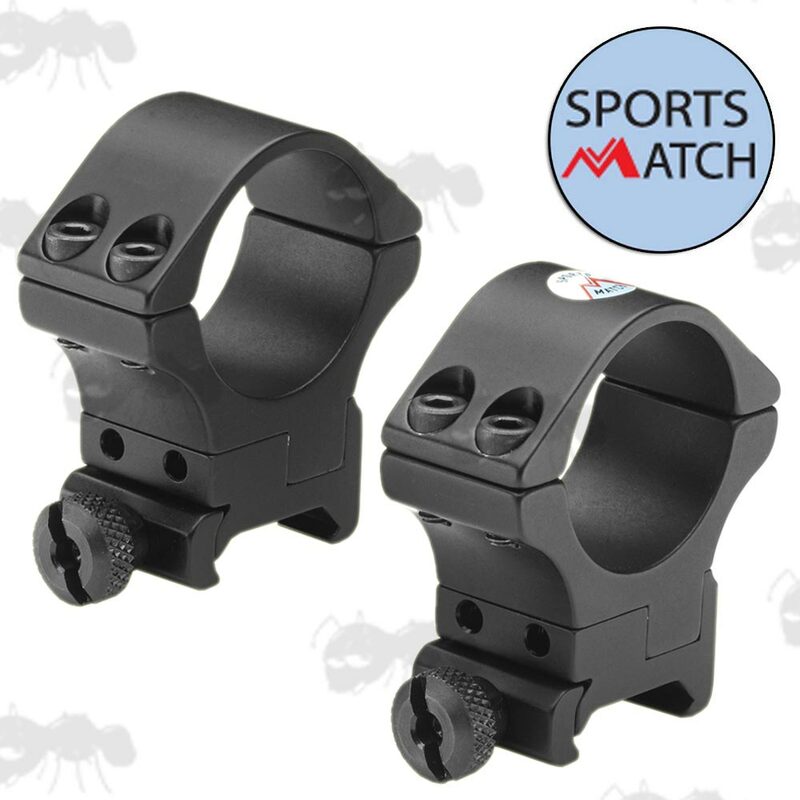 Provides up to 50 MOA adjustment on elevation and height. 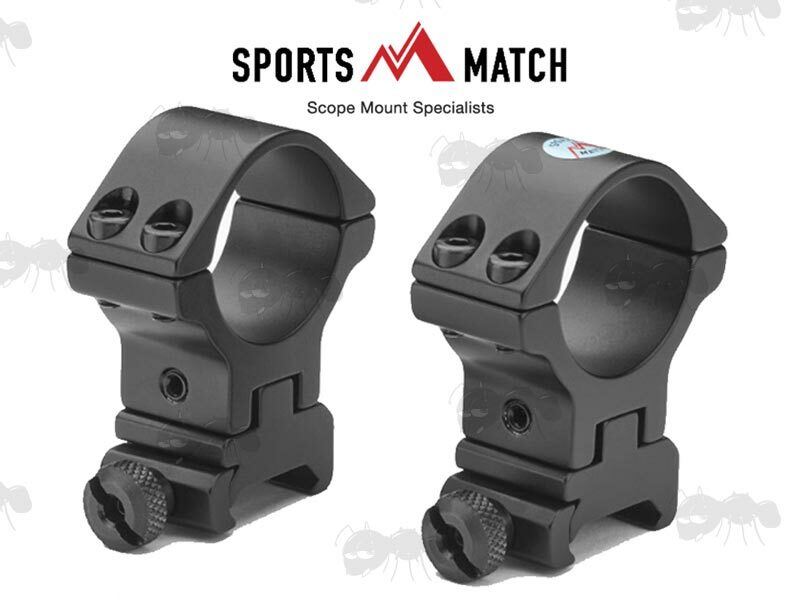 30mm diameter body tube high range scope rings suitable for all Weaver / Picatinny rails. Ideal for long range shooting. This product is designed to maintain exact alignment with the scope during adjustment provided these instructions are followed correctly. Ensure your rifle is unloaded prior to fitting this product. 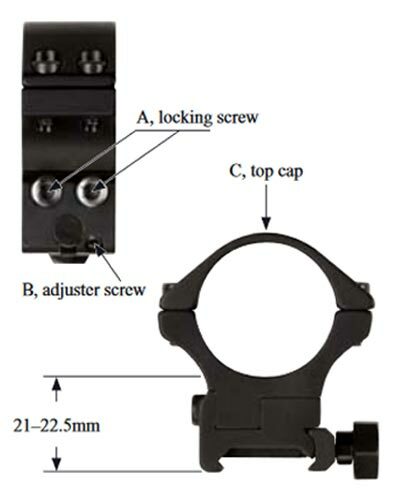 Fit mounts and scope to rifle in usual way and check adjuster locking screws (A) are securely tightened*. Shoot a five shot group and note the point of impact. To adjust elevation, loosen locking screws (A) on front and rear mounts. Turning the adjuster screw (B) clockwise on either mount will increase the angle by 4 MOA (minutes of angle) per 1/4 turn. The maximum adjustment is 3 turns (50 MOA. These figures are approximate and based on a mount spacing of 80mm. Re-tighten locking screws (A) FIRMLY. Shoot another 5 shot group and repeat step 4 as necessary. 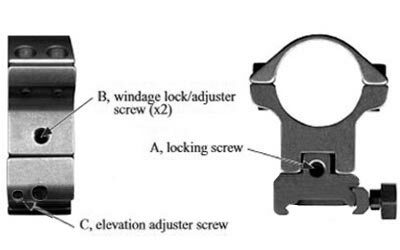 To lower mounts undo locking screws (A), on front and rear mounts, push firmly downwards on the top cap (C) whilst turning screw (B) anticlockwise as required. Retighten locking screw (A) FIRMLY. Both front and rear mount adjusters can be used to lift scope evenly if required. *In some cases it may be necessary to adjust mounts up before fitting for clearance reasons. If this is the case we recommend that you leave screws (A) loose until scope is fitted. Provides up to 65 MOA vertical adjustment. Ideal for Yukon Photon XT and RT digital night vision sights.